German migration to Minnesota peaked during the decades of the 1860s and 1870s. The historical German opposition to prohibition in Minnesota is reflected in a strong beer making tradition throughout Minnesota, and we have a fair share of German restaurants, to boot. The Black Forest Inn has been around a long, long time in Minneapolis - 41 years, to be exact. I figured it was about time for me to stop in and try their sausages because it's no secret that I *heart* housemade sausages. Erich Christ's reasons for making sausage from scratch make sense to me: "At a time when other restaurants were buying more and more of their products finished and pre-packaged we were trying to stay in the same price point, and make our food better, fresher and more interesting." 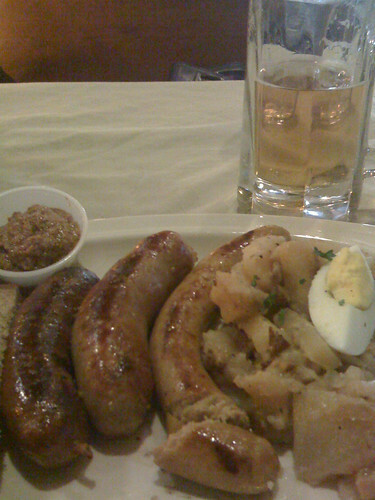 For our lunch, I sampled three sausages (from left to right): the polish sausage, the bratwurst, and the chicken curry sausage. The links were served with their German potato salad and some rye bread. From left to right: The polish sausage was a bit dry, and the flavor was slightly barny. The bratwurst was lean, moist, and lightly seasoned; the ground meat was finer than a typical bratwurst. The curry chicken sausage was seasoned with a light hand as well and was lean and moist. The sausages were cooked properly - with casings that were clear and crisp. Overall, I would have preferred a slightly heavier hand when it came to seasoning the sausages. The German potato salad was prepared with sliced potatoes, bacon, onion and cider vinegar. The bacon was cooked properly, and the cider vinegar added the appropriate level of tart acidity that I appreciated. The rye bread was light in texture, color, and flavor. The rathskeller-style dining room and bar make for a fun atmosphere, perfectly suited to flights of German beer. Interesting sausages made fresh in Minnesota definitely peak my interest. It would be great to see them take "home made" one step farther by sourcing local meats for the sausage they make. Time to get our sausage on!